The scene of the arena after the end combat of gladiators showing the victory of murmillo. Murmillo stands on a dead gladiator body of retiarius. Oil on canvas by the French painter Jean-Léon Gérôme: Pollice Verso from 19 century. Image credit: © Phoenix Art Museum. All rights reserved. Photo by Ken Howie. The term gladiator came from the Latin word gladius for the Short Sword used by Roman troop soldiers. In the beginning, gladiator was an swordsman who participated in combat competitions. 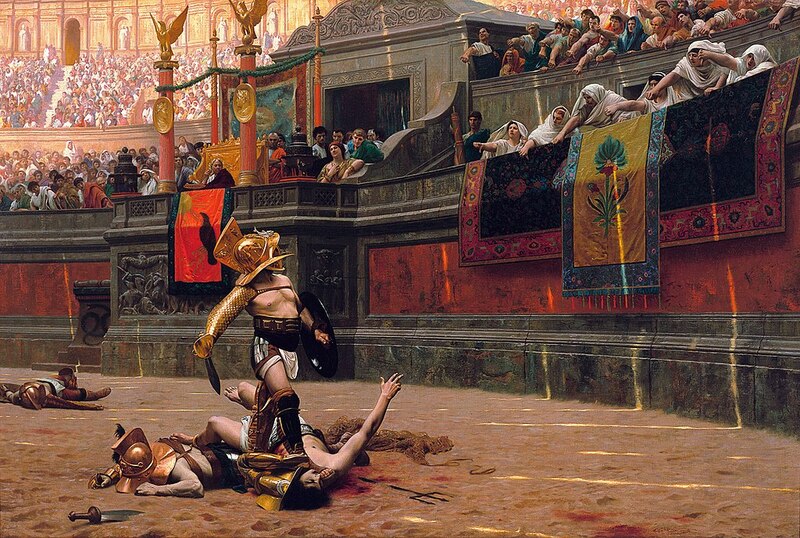 In later stage, gladiators were professional fighters at the time of the public combat tournaments in ancient Rome. Historians believed that tournament of gladiators originated from the ancient Etruscans for the purpose of funeral ceremonies, while the another opinions advocate idea that those games originated from the eastern civilizations. Gladiators were war prisoners and slaves, convicted criminals, professional fighters and Christians (at the time of their persecution) or free Roman citizens with their own will. It was known according to Titus Livius (Livy) that combats of gladiators in Roman Republic held for the first time in 264 BC, but that does not mean they were not organized before this date. During the time of the first combat games, gladiators were named bustuarius or grave because those fighters were prisoners whose blood was sacrificed for decedent. A more massive events of the gladiator games begins at the time of the territorial spreading of the Roman Republic and during the Punic Wars between Rome and Carthage. Marcus Aemilius Lepidus in 216 BC organized in Rome games involving twenty-two pairs of gladiators. Consul Publius Licinius in 183 BC organized three days of games involving around 120 gladiators. In the later stage of the Roman Republic, the number of gladiators who participated in the tournaments increased even more. Thus, Julius Caesar organized the games (after he was elected for curule aediles) in 65 BC involving 320 pairs of gladiators who wore a silver armor and finally roman emperor Trajan in order to mark his victory over the Dacians in 108 AD organized 123 days of games used around 10.000 gladiators and 11.000 wild animals. During the events gladiators fought against the animals or between themselves. The gladiators games shows also another important function in the roman society: in addition to the display of Roman sense of superiority, it served as a social outlet and despite strict class – distributed seating, it was united together the Roman citizens in the moment of the celebration and cheer, giving them a sense of community. Plebs and Aristocracy united in a fan base. Even the poorest beggar could feel lord of life and death in these few little moments as he waved his handkerchief for his losing favorite. At the same time, the amphitheater gave the people the opportunity to express their displeasure directly to the emperor: The loud cheers when the Emperor entered into arena and took his place to seat. The mass of the gladiator fans in this moment neglects or approves his presence depending on his previews governmental decisions. In ancient Roman society there was around twenty different types of gladiators. But there was also five classic gladiator types, which differed by body armor and offensive weapons. The Samnite gladiator belonged the people of Samnium or Samnites who were inhabited south-central Apennine Peninsula. At the beginning of the territorial spreading, Roman Republic fought against Etruscans, Celts and Samnites. After three long wars against Samnites (343–341; 327–304 and 298–290 BC) Romans managed to achieved victory capturing many prisoners and taking them to Rome. On that way, many Samnites warriors (who were armed with gladius or short sword, rectangular schield or scutum, helmet and greave or orca) became Roman slaves who had to fight in combat games. Since the Samnite warriors fought in the games for their masters in the early stages of the Roman Republic this type of gladiator can be considered as prototype of all other types of gladiators. Thraex of Thracian gladiator wore a wide-brimmed helmet, a small round, sometimes rectangular shield and fought with the sica, a curved sword, the traditional weapon of the Danube warriors. Thracian gladiator was equipped with light armor and this was made easier for him to move faster. Gallus or Gaul Gladiators like the Samnite and Thraex were also war prisoners at the early stage of the Roman Republic. The number of slaves who were taken from Gaul increased especially after the military campaign of Gaius Marius at the beginning of the II century BC and during the Gallic Wars led by Julius Caesar 58-51 BC. His Gallic equipment consisted of the flat shield with a hump and the longsword. His curved helmet looked scary. If these fighters were truly like traditional Celts (or Gauls), probably those gladiators preferred to plunge as a hero in battle. In the Roman Imperial Age, the name changed to murmillo, because the fish mormyrus was used as inspiration to create a helmet shape and decoration. The added helmet had no visor (instead it is used metal mesh) and the shield was modified to a long, octagonal shape. Considering that this type of gladiator held in his hand a sword long 60-80 cm (within weight around 1.5 kg) this required a special physical readiness to fight. Retiarius (which on Latin meaning fisherman) or net-fighter was also one of the most famous type gladiator. He was not really a gladiator in the true sense, since he did not used standard sword (gladius). The retiarius only wore armor on his left side of the body to at least try to block the blows of his opponents. He only used weapons just like a true fisherman: fish net, trident and dagger. His advantages consisted by maneuverability and the greater distance of the trident. If he succeeded in throwing his net so skillfully that his opponent caught himself and hindered himself, retiarius had good chances to finish the fight victoriously. If he missed the chance to hit his opponent, he had to run away and look for another opportunity to pick up net safely. The secutor wore the rectangular scutum and the gladius of the legionnaires, shield for arm made of thin plates. His helmet was designed in order to fight easily against retairius. Helmet was egg-shaped and rimless. The visor was folded up like the medieval knights’ helmets. Obviously, this helmet had been specially designed so that it would not easily catch in the net of its main opponent, the retiarius, while at the same time allowing a good view. Secutor roughly meant “pursuer or chaser” perhaps because he was often busy running after the retiarius. In addition to these standard classes, more gladiator types were introduced especially in the Roman imperial era. During the time armor and weapons of the existing gladiators changed so that new fighting methods grew out of these encounters. Dose changes developed new types like the dimachaerus (gladiators who fought with two swords), eques (gladiator horsemen) and essedarius (gladiator who fought from a chariot). A grotesque development of secutor helmet used by andabata gladiator. The visor of the helmet were completely closed, so the andabata wore a helmet with no eyeholes and fought blind like the victim in the Etruscan Phersu games. The usual gladiator combat held in pairs or one against the another. Their name speaks for itself: they were called ordinarii. Another concept was group against group. Such fighters were called catervarii. Group fighting was harder for referees and for the spectators to observe down the scuffle. Very rarely, women also went into the arena. Roman emperor Nero forced aristocratic womens and men into the arena for his pleasure: Emperor Domitian also organized women fighting by torchlight and another time against dwarfs. Emperor Septimius Severus, however, at the beginning of the 3rd century AD, banned by the law combats of the female gladiators. Initially, the fights of gladiators were conducted within combination of non-experienced and experienced warriors. Those initially fights were place for execution in which only a few have survived. The survivor was often “ad ludum” or trained one who had the opportunity to earn his freedom through several successful fights. Warriors had the great advantage because they were already trained to use weapons and they could offer to spectators a more interesting fight compare to laymen. In the period of late Roman Republic, the popularity of gladiator fights rose immensely. Because of the worship of the gladiators, more and more Roman free citizens had to will to become gladiators. At first, those volunteers citizens were from the lower classes. This high percentage was surprising because a free citizen entered into some kind of slavery when they entered into school of gladiators. Although they kept their citizenship, they had to prescribe their body and soul to lanista, or the owner of the gladiators and training school. Gladiators had to say an oath or sacramentum like “Uri, vinciri, uerberari, ferroque, necari” which means “Be burned, bound, beaten, and die by the steel (sword)”. The training of the gladiators took place in the ludus (training school). One of the most famous fighting schools of the republican period was in Capua where Spartacus launched 73 BC his rebellion. During the imperial era there were four famous gladiator schools in Rome: Ludus Magnus (the largest one was built by the emperor Domitian), Ludus Dacicus (founded by Domitian and finished by emperor Trajan), Ludus Gallicus and Ludus Matutinus – in which about 2,000 gladiators were trained. The gladiator schools were well-organized with their own weapon makers and doctors. In particular, the surgical skills of these doctors were at high standard for that time. Like the theaters, the gladiator schools had also seats for spectators and it was a favorite time for Romans to observe the training of their gladiators. The lanista earned his money through the sale or rent gladiators. In the imperial era the ludi (schools) were also financed by the emperor and by the high officials like the curators or procurators. The schools of gladiators were virtually controlled by the emperor, because it would be too dangerous for empire to leave paramilitary troops in the hands of a private person. The shelter in the barracks of the school was comfortable and food quality was better compare to the food of other roman citizens outside of training school. Because the gladiators were cost a lot of money the owners treated them with care. The combat training was very hard and rough. The harder the training, the greater was chances for gladiator to leave the arena alive. The life or death of a gladiator ? The fight of the gladiators began with a loud trumpet sound. During the gladiator games Roman orchestra consisted of trumpets, horns and water organs or hydraulos. Different types of gladiators tried to use the advantages of their weapons and they trained to defeat their opponents – while the opponent of course tried the same. The winner of a fight, always left the arena alive. He may have succumbed to his injuries afterwards, but he rarely died in front of the audience. The loser could give up: He can threw his weapon and shield, crouch on his knees and begged for mercy with outstretched forefinger. In a true Titan fight in which no winner could be determined, they ended the fight in a draw when both gladiators at the same time throw their weapons and gave up. The editor (sponsor and organizer of the games) had called for a fight with the finger, while the audience wanted to stop this fight and finally editor and audience could agreed to this compromise. In the arena sometimes several duels took place simultaneously and each coach was a referee at each fight. So the loser had a chance to recover even if he fainted from exhaustion. As it could be seen from the mosaic on the tomb from ancient city Pompeii, there was a referee intervenes when they hold the victorious gladiator from the deathblow. The loser’s life ultimately depended whether he was a good fighter. The final decision was made always by editor during a munus (commemorative duty). When the gladiator had given up, it was important for him to face death as stoically as possible, as the audience wanted to see the death of their intrepid heroes. The audience influenced the editor, with shouts and gestures, which finally decided on the further fate of the inferior. When the fight ended with the death of a gladiator, an servant dressed as god Mercury (gr. Hermes Psychopomps = “the soul-accompanying Hermes”) entered into arena and tested if gladiator was still alive. If the gladiator was really death, then the underworld god Charon, a masked priest and the goddess of the funerals and burial Libitina, joined in the arena. They claimed the body of the dead gladiator with the stroke of a hammer on the forehead. 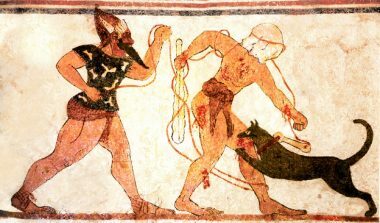 This method was originated from the ancient Etruscan practice, who were sacrificed animals in honor of Libitina. Mercury dragged the body with a hook through the porta Libitinensis, a small gate in the arena wall. A hook was used to avoid contact with the dead body. If loser survived the fight but sentenced to death by the editor, there was no mercy. In that case gladiator was killed outside the arena. However, if the audience was in a particularly bloodthirsty mood, they could demand from the editor to execute gladiator looser in front of their eyes. This must be a honorable death for gladiator: he kneels down, clung to his thigh, and bowed his head. The victor gladiator held the helmet or head of the defeated one with one hand, while he severed the cervical vertebrae with his sword on the another hand. Killing the wounded gladiator in the arena was the norm among convicted criminals. The winner was rewarded with victory palms and later as the professional gladiatorial industry became more prevalent he also got a winning prizes in money. According to Cicero a successful gladiator was called the “plurimarum palmarum gladiator” or “the gladiator with the most palm trees.” The audience could ask the editor to give freedom to old gladiator or especially popular one. If the wish from audience also granted by editor, those gladiators got a wooden sword (rudis) as symbol of freedom. Freed gladiators were also called rudiarii. This took place usually after about three years of serving as gladiator. In rare cases for extraordinary courage novice (lat. novicius) gladiator could also gain a freedom from the editor. Although gladiators were very popular, as free citizen they were not socially respected as actors and prostitutes. A free citizen who had once been a gladiator had stained himself in the eyes of his fellow citizens with disgrace. He had no longer the necessary reputation to progress in roman society compare to other free roman citizens. M. Tullii Ciceronis, Orationes, Tom I, Pars I, Ex typographia P. & J. Blaev, 1699. Alexander Adam, Roman Antiquities: Or, An Account of the Manners and Customs of the Romans, London 1825. William Smith, A Dictionary of Greek and Roman Antiquities, London 1842. Samuel Ball Platner, A Topographical Dictionary of Ancient Rome, London 1929. Roland Auguet, Cruelty and Civilization – The Roman Games, New York 1994. Murat Aydaş, “Gladiatorial Inscriptions from Stratonikeia in Caria”, Epigraphica Anatolica 39 (2006), p 105–110. Wolfgang Neubauer, Christian Gugl, Markus Scholz, Geert Verhoeven, Immo Trinks, Klaus Locker, Michael Doneus, Timothy Saey & Marc Van Meirvenne, “The discovery of the school of gladiators at Carnuntum, Austria”, Antiquity Publications Ltd. 2014, vol 88, online issue, 2014, 173-190.